Do you own a Junior Hack Attack pitching machine? You can confirm by looking at the bottom of the speed control dial label where you will find the machine name. 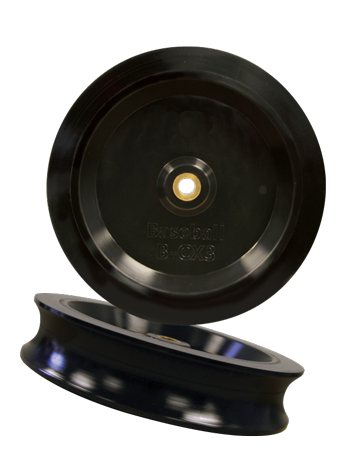 Check wheels for ball material build-up and visual damage. For removal of ball build-up, click here for instructions. For any visual damage, call customer service. The equipment must be used with the proper power source and extension cord. A 20-amp service is recommended for continuous operation of the machines. Use a minimum of #14/3 grounded power cord up to 200 ft. in length. A longer cord will require the opinion of a licensed electrician. Any generator that is used must generate “clean electricity”. We recommend a minimum of 1000 watt up to 2000 watt Honda generator with inverter technology. Weight of these generators is approximately 27 lbs., similar to the weight of a battery, and they are extremely portable. Unless the generator provides “clean electricity”, the power surges from the generator will cause a machine to surge and become erratic, it will deliver a ball very inconsistently. Softball machines must be used with the proper balls. The softball machines will throw almost any ball including leather, poly or foam balls. It is always best to use balls that are the same type and age to ensure accuracy. Synthetic balls are not recommended under any circumstances as they will not only wear rapidly, but will often leave a residue on the throwing wheels. See the respective manual for instructions on how to clean build-up off of a throwing wheel. In softball, ball delivery is easily dialed in using the pitch selection chart. If the machine dials are all set at the same number, you will get a ball delivered with no spin. This is a knuckleball, a pitch that is unpredictable and can be perceived as erratic. To get a true fastball or breaking pitch the dials must be set at varying positions that are outlined on the pitch selection chart on the machine. Please reference this chart to easily dial-in your desired pitch. Check to make sure you are using the proper extension cord (can’t be too light or too long), check product manual for specifications. Using mixed balls (types or ages) will cause inconsistent pitching. Get one ball and throw it repeatedly, if inaccuracy disappears then this is the cause of your inaccuracy. Check dial settings against recommended settings on machine or manual. It could be incorrect wheel speed settings. Are the balls you are using wet? Balls have to be dry to throw accurately. Wheels are peeling or coming apart. There is a decrease in speed when pitching a ball. Are the balls you are using wet? They have to be dry to throw accurately. Speed control knob will not stop at the “0” or “10” position, indicating the knob is set improperly. Call Sports Attack for service procedures. Using mixed balls (types or ages) will cause inconsistent pitching. Get one ball and throw it repeatedly, if decrease in speed disappears, then mixing of the balls you are using is your problem. One or more ball throwing wheels are not spinning. The circuit breaker is tripping. Control knob will not stop at the “0” or “10” position. There is a lot of vibration/noise when the machine is running. Check all the motor bolts and wheel bolts to make sure they are securely tightened. Turn all three dials to “0”, increase one wheel at a time to max speed until you find which wheel is causing the noise. When wheel is isolated, turn machine off, set all three dials to “0.” Then remove suspected wheel but don’t lose keyway key. Turn the power back on, increase the speed of the motor where the wheel is now missing. If the noise still persists, you have a bad motor. If it is no longer making noise, then the wheel needs to be replaced. Check power source by plugging a known good device into the machine end of the extension cord to ensure you have power to the machine. Push in on circuit breaker to see if it will reset. If it breaks again, call Sports Attack customer service. Click here for instructions on replacing wheels, motors and controllers. Click here for instructions how to install fungo legs.